Well , and now for something completely different, or at least for me. A Rugby Trip! 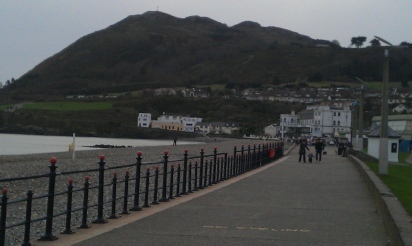 Rob’s been to Ireland, more specifically to Bray a seaside resort in the south of the country. The trip was by coach and ferry, the former something I don’t chose to do as I don’t do it well, the latter something I had never done! So at sparrow fart (6:30am) I get up, shower and drive to collect my brother, then we head to Llantwit Fadre where we meet our travel mates at the coach depot. 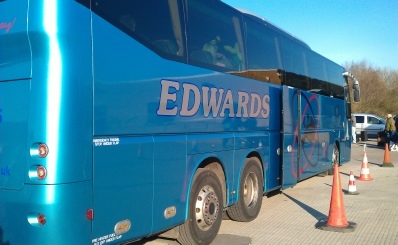 We get on the coach, very nice, very modern: toilet, tv’s etc. and at the start we are the only passengers. Now it was at this point the alarm bells should have started ringing, as they certainly weren’t going to lay on a full size coach for the 6 of us. 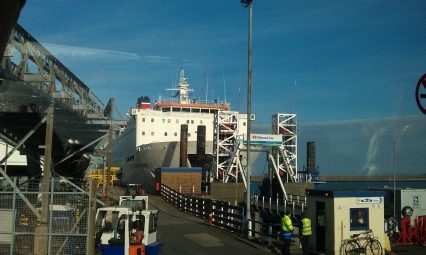 We head straight into the ferry, disembark from the toast rack … toast rack?? Our affectionate name for the back seat of the bus, as at any one time at least one of us had to lean forward to allow the others to sit back, mental note to self, when you have 6 large gentlemen on a bus DON’T BOOK THE BACK SEAT! There is nowhere for you to go. 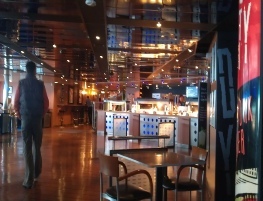 Once we got out of the bus we headed up about 3 floors to the “communal” decks, where you had a shop, cafe, bar, TV lounge, coffee shop, some cabins and some shared seating areas. Also from where you could (one floor up) head out to “take the sea air” read “Freeze your n*ts off” on the open deck, as it was bitter out there. But hey wadda you expect it is FEBRUARY after all, not really thinking pool parties, deck quoits and sun-loungers. 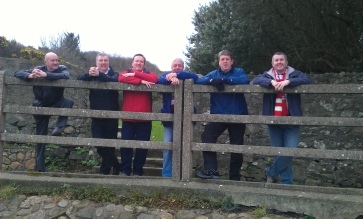 We headed to the cafe and had a nice meal and a few pints, well come on it is a Rugby trip! and at this point, 30 mins into our sailing, I knew I wasn’t about to turn into Elphaba (check out Wicked the Musical to understand the joke! … okay … she’s the wicked witch of the west in The Wizard of Oz so … bright green … green … at sea … get it?? ) 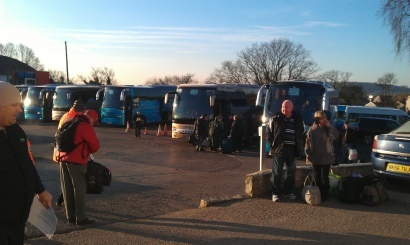 and the longest part of the coach journey was over. The only off putting part of the trip was opening the door of the gents, luckily managing to avoid going base over apex over the raised panel at its base, and seeing a rather large gentleman stripped to the waist washing his feet in the sink! Oh, isn’t technology a wonderful thing, there was I in the middle of the Irish Sea tweeting like a good un and checking my facebook page, I know I know I’m a geek, the point I’m getting at is the ferry had free Wi-Fi, mind you they’re not THAT generous, calls could also be made but ranged from an eye watering 99 – 1.99 Euros per minute! I really enjoyed the sailing, and with the crossing categorized as “moderate” meaning there was an even calmer possibility, it’s something I would be quite happy to do again. 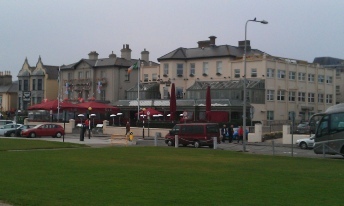 After about 3 ½ hours it was back to the toast rack and another 2 ½ hours on the coach as we headed to the Royal Hotel at Bray. 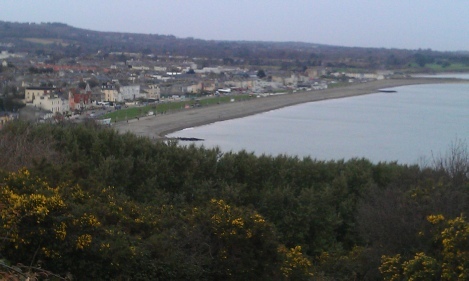 Now Bray is a seaside resort about 12 miles outside Dublin. 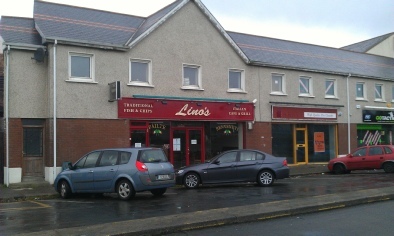 It has in some reviews I’ve read been referred to as the “Blackpool of Ireland”. Well in so much as it’s a seaside resort and has a beach, the sea, pubs and restaurants, and other entertainment venues, 10 pin bowling, cinema, amusement arcades etc. then yea, but could just as easily be the Bournemouth or Brighton of Ireland, especially if there was an intended negative undertone in the initial description. Personally I LOVED the place and would have no qualms about returning. 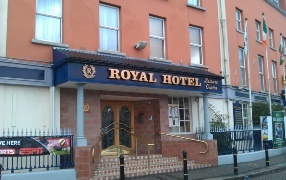 The Royal Hotel is in the centre of Bray about a 5 minute walk from the seafront where the majority of the larger bars are. 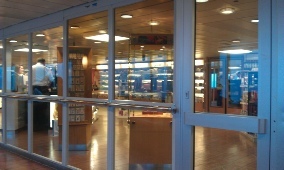 We pulled up outside, the driver went in, the manager came out to welcome us, we disembarked and by the time we got the cases and entered reception we were handed our keys and could head straight to our rooms. 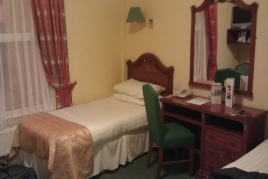 In fact my ONLY negative comment relating to this hotel was illustrated on the last day, we checked out at 12pm (checkout time) and were leaving Bray at 3:30pm so had a few hours to kill. 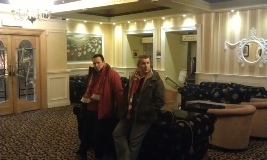 So we went for a walk then returned to the hotel to sit, chat and wait for the coach. Well I suffer with my stomach and with a long coach journey facing me headed to the toilet, and found the door locked. It was at this point I realised that the ONLY WAY you can use a public toilet in this hotel is to either use your room key (already been handed in) or ask at Reception to be “buzzed in”. Now come on this is a large hotel in the centre of a big town, there is a public bar and a restaurant open to the public and the only way to use a toilet is to ask at reception, fail in my book I’m afraid. Other than this one aspect I would as I mentioned have no problems in recommending this hotel to anyone and am already looking forward to returning in 2 years, when Wales v Ireland is in Dublin again. So it is Friday evening, we’ve been on a coach for 12 hours with only a 3.5 hour ferry journey to break it up, so what’s a guy to do, that’s right HEAD FOR THE PUB! 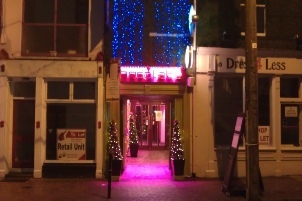 We wander towards the sea front and end up in The Martello Hotel, a really nice venue right on the sea front, with a semi-enclosed “porch” where the one “slave to the Cig” amongst us could quench his craving without having to stand on his own for the majority of the evening. We had a few pints here and then head next door to The Porterhouse another nice venue, this one a bit like an inverted Tardis, as in looks huge from the outside but has a more “cosy” look inside, with lots of corners, nooks & crannies … okay clever swine I know every building has corners but you know what I’m trying to say. After a few here the coach equivalent of jet lag started to kick in and we agreed discretion being the better part of valour we would grab some food and head back to the hotel. Minor heart failure when we noticed the closed sign on the main door ensued and it took all our combined brain power to spot the “open” sign on the smaller takeaway door. Doh! We entered, perused the menu and settled for Breakfast rolls x 6 and chips x 6, who says I don’t know fine dining. Tell you what though the repast was prepared fresh and was DELICIOUS! Reasonably priced and quick, all in all the perfect late night “snack”. To the hotel, to our beds and to Day 2. After a shower it was to the restaurant for the inclusive breakfast: toast, coffee, tea and a “buffet style” help yourself to sausages, eggs (2 types), beans, bacon, black pudding , cereals etc. and fruit juice, a very nicely prepared and served start to the day. We had decided, as two of our number (me being one of them) had never been to Ireland before to head into Dublin for a wander round, being ticketless (queue Max Boyce song here) we thought we would do this on Saturday rather than Match Day (Sunday). 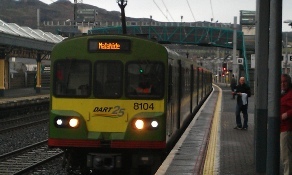 We caught the Dart, an electrified train service to Dublin, costing a very reasonable 5 Euro return. The carriages were clean, the service punctual and efficient. Even sticking our heads round the door to see if they happened to have half a dozen tickets lying around that had maybe had fallen down behind the sofa or something, no such luck! 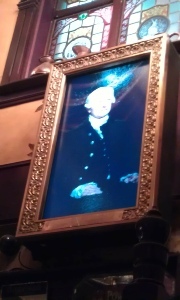 Main point of interest was this (excuse quality of pic) a “painting” that is actually a screen, the figure sitting perfectly still for minutes on end, and then reacting to an imaginary fly or nodding off, simple but surprisingly addictive as you try and catch when he “goes”. We had a few here, and then continued our tour of Dublin. 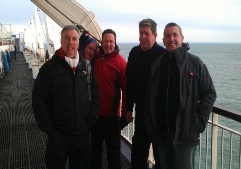 Passing some sights, crossing the Liffey, and getting an elocution lesson on the hoof. As we were crossing the Liffey we spot a promising looking hostelry and one of our number says “let’s go to the (just realised how difficult this is gonna be to explain in writing, but here goes) Half Penny..” at which point a local crossing the bridge in the opposite direction, without missing a beat, or step shouts “hA’ Penny”. Great place and without a doubt THE friendliest people I have ever met ANYWHERE! 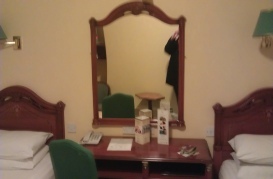 We settle into the Ha’ Penny Bridge Inn, what can best be described as a “local” in the middle of a bustling city. The beer was good, the welcome heartfelt and genuine, even to the extent of some impromptu flower arranging on the window above us to make us feel more at home! 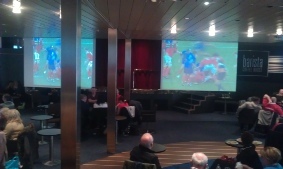 We spent a few hours here watching the first match of the 6 nations France v Italy. We then head to the Dart station at Tara Street, and after Rob showing off by managing to work out the ticket machine before any of the other of my esteemed colleagues, had to put that in. We arrive back in Bray and head to our home from home, the Martello, and watch the end of the England Scotland Match, partaking at the same time of a lovely meal. 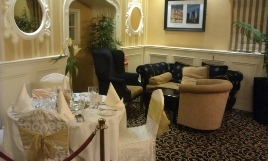 This venue has table service, an excellent selection of food, a small nightclub, together with: a function room, self catering apartments and en-suite rooms, and is definitely at the top of my list for similar venues I have visited on my travels. We call on our journey home to The Hibernia Inn, an imposing building with a nice atmosphere, quiet on the night we went there, although I believe as we left they were about to start the evening’s entertainment, so it may have got busier then. Day 3 – Match Day, we start with: Pool, Sauna & Jacuzzi (not running the previous morning, but another tick off my list of new experiences today), breakfast, then one of our group, recently swelled to 7 with the addition of a genuine Irish man, a friend of one of our number who travelled down for a concert which happened to be in our hotel, while we were staying there, and joined us for the day. A genuine treat to meet you Sir! Anyway I digress, an innocuous question of “what about a little walk along the sea front to blow away to cobwebs before the match” is raised … Well all I can say is see this … Well I walked UP THIS… “a gentle walk” my a*se! 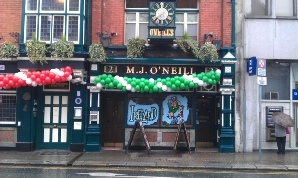 So after nearly walking ourselves to Leprechaun size we arrived at The Martello, now we had been clever, some might even say Machiavellian, the night before as we attempted to drink the place dry and eat our own combined bodyweights, we asked if it would be possible to reserve two tables for the match the next day, the lovely young lady serving us checked and confirmed this would be possible. So we arrive to our reserved tables to be greeted with a minor problem, the TV right by our seats had a little sign (not there the evening before) stating “only football on this TV” Oh £$£%^” we said in union, and immediately decamped to the other end of the balcony area where the screen informed us that it would indeed be showing the game played by men with odd shaped balls! 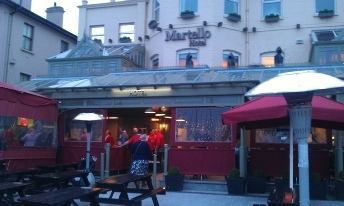 We left the Martello, an hour or so after the match, and wandered to “Katies”, another Bar on the seafront, and although the venue was quiet we were again given a wonderful welcome. To the extent that an older gent came onto us and congratulated us on the win, despite the fact he was Irish, and then insisted on buying (all 7 of) us a drink, which when they duly arrived and we tried to return the favour, met with the instructions that “Mr Duggan would not accept one back”. 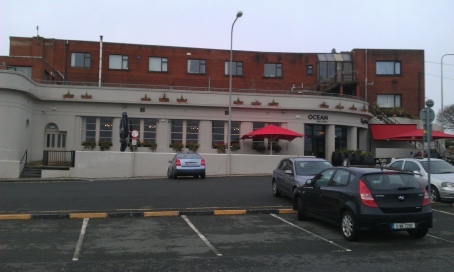 We later confirmed the reason the bar staff took Mr Duggan’s instructions over ours, was that he owned the place as well as the Martello. 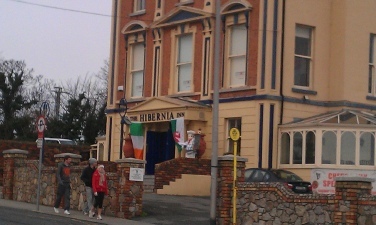 Next we headed to The Hibernia, and had a few pints there with the locals again being magnanimous and welcoming in equal measure, this of course did not mean they didn’t at the same time take the Mickey out of us something unmercifully. 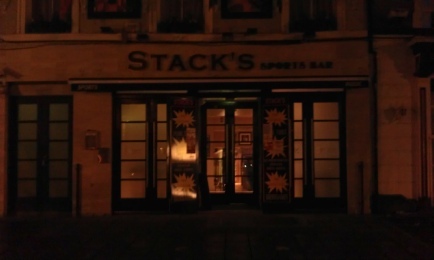 A brief stop at Stack’s Sports Bar, again quite quiet, well in numbers, although the disco in the corner made up for this in volume, and we decided to call it a day just as Monday arrived. 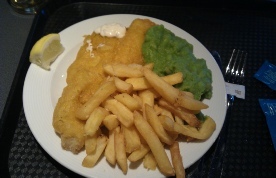 So with a quick stop for the now traditional nocturnal Breakfast & Chips we headed to the hotel, arriving late enough to confirm by our footwear that none of us were relatives of Cinderella! Come on think about it. Monday and the day I wasn’t looking forward to, the end of a wonderful trip and a VERY long homeward journey. As mentioned earlier we had breakfast, crashed in our rooms for a bit, checked out then hung around basically, well I hung my esteemed co-travellers decided on another stroll, so discretion winning out again I stayed in the hotel, and was gifted by reception an hour’s Wi-Fi access, so took the chance to catch up on my tweets (@WelshRok for those interested). 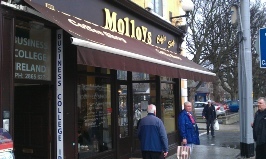 I met the guys in Molloys for a cake and drink (coffee for them, Sprite for me, as I never drink anything hot). We got on the bus, drove for about 2 and a bit hours and were dropped off in Wexford for a chance to stretch our legs and get a meal. 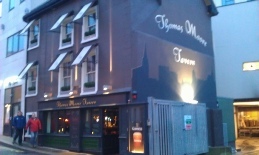 Here it was we discovered a few things, Discovery 1: a very nice pub called the Thomas Moore Tavern, excellently decorated and designed, deceptively big and offering the now traditional warm Irish welcome. Discovery 2, most places don’t serve food on a Monday in Wexford, a consideration one thinks if coach tours are planning to stop off here regularly, and finally a nice bar called “Chocolate”, more modern in design it offered: excellent food at a reasonable price, 5 Euro starters and 10 Euro main courses, a waiter from Port Talbot, don’t ask we don’t know either, maybe a very strong swimmer, who knows. The meals were great I had Chicken Strips and Chips the others Meat Sizzlers, which lived up to their names as we could hear them arriving when they left the kitchen, and the one next to me kept spitting at me for a good few minutes AFTER it was served, oh and the chips were served in individual metal buckets, a new but nice touch for me. The only thing that let this place down was the toilets, which definitely needed some attention. 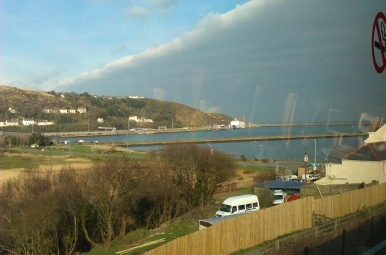 Back to the bus, onto the ferry, where unfortunately we were last on, literally. They closed the bulk head behind us! So when we got to the upper decks most of the seats, and all the comfortable ones were gone, which left us trying for the Olympic sport of contortionism i.e. trying to fit a number of 6ft plus men onto very narrow curved seats with permanent arm rests to try and lie down for a bit. Eventually we admitted defeat wandered up a deck and found an area of surprisingly comfortable floor where we laid down using coats as pillows. After a noisy (passengers not Ferry) journey it was back to the toast Rack and nearly 4 hours of winding roads and pain at the back of the bus, eventually getting back to the depot at 4:20am. All in all one of my favourite trips ever. 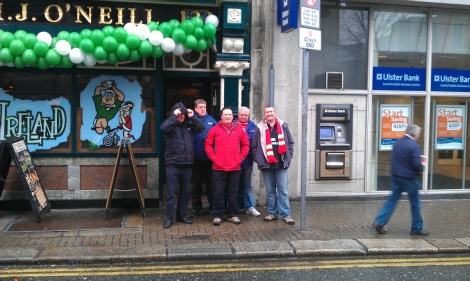 The cliché of the warm welcome in Ireland was proved time and time again, by everyone we came into contact with. 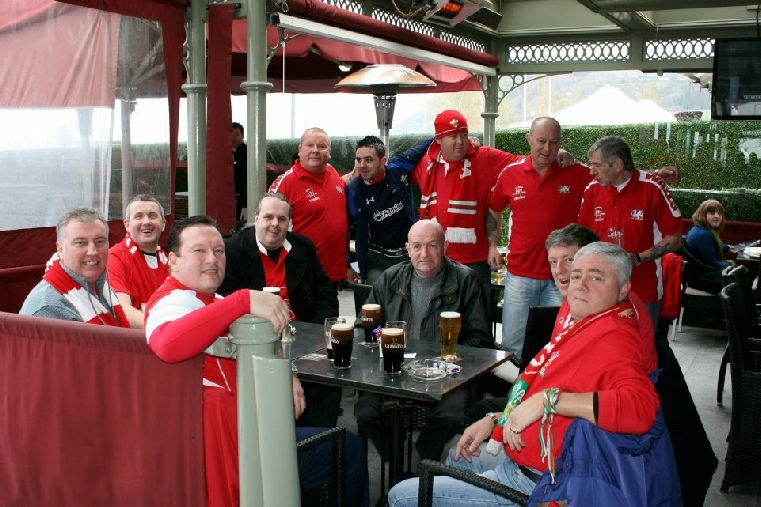 I am definitely planning another trip, as discussions on the bus during the return journey had already turned to Italy 2013, oh and a final thanks to all my brother’s mates who made this “outsider” feel so welcome. To next year gentlemen!